No matter whether you are on a business trip, attending a conference or a private guest, experience the refined 3-star comfort in a personal atmosphere at fair prices at Hotel Erlenhof. The interior design of our house reflects our demand for a modern comfortable hotel – all the elements were fine tuned to provide you with a feeling of comfort as our guest in your “temporary home”. Let your day come to an end with a drink or a meal at our Bistro P’erle. Our bar, which also serves hot dinner, is frequently visited by our hotel guests as well as by the residents from the Biberach area due to its cozy atmosphere. You would like to start your weekend day in a special way? Our rich and fresh breakfast buffet is also available for non-resident visitors. Please let us know via telephone, if you would like to have breakfast in our house. The Hotel Erlenhof is centrally situated. The main train station or the historical city centre are only a few minutes’ walk, or if you prefer, drive, away. We offer year-round special offers for groups. We cooperate with the best proprietors in town, to ensure that all your needs concerning food and evening entertainment are met. Feel free to enquire with us! Please let us know if you intend to check-in at other times! Cancellation terms: Cancellations with a 24h prior notice are free of charge. Short-term cancellation or failure to appear will be charged with 80% of the price. Corporate clients and group trips are subject to special cancellation terms. Enjoy your stay at Hotel Erlenhof even more and stay in one of our rooms with comfortable box-spring beds. Ask our team! 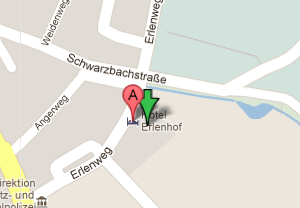 Hotel Erlenhof offers free WLAN for all guests.